Today was the first day of school for my little 2nd grader. He was filled with anxiety (because he wasn't sure about how to use punctuation in his writing of all things!?) and because he said he was going to miss me. After spending a whole summer together, it was hard to spend a day apart. So in an effort to re direct his anxiety, I promised him a surprise snack when he got home. 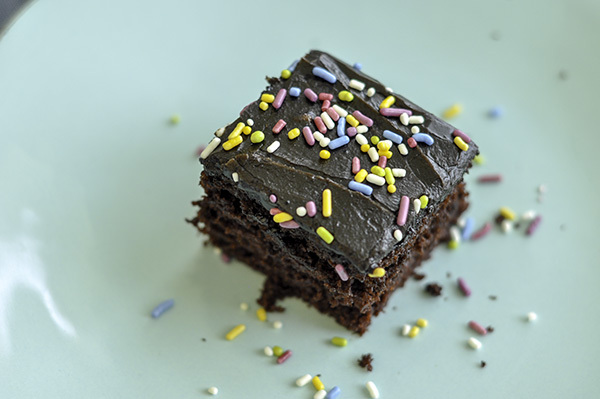 And what's more fun than this simple After School Dark Chocolate Snack Cake! I searched and thought about what to make for hours. Should I make a fancy swirled cake, should I make it healthier by adding zucchini or using almond flour? But I decided to make a simple cake based off of a Texas Sheet cake recipe... after all we are in Texas now! I figured I'd have plenty of time to make him cake he didn't want to come home to, but today he needed something special. Now, I didn't go off the rails and add cups and cups of sugar to it. I cut the sugar in half... which is still a whole cup! And since I was going to frost this cake, I wasn't worried about the lack of sugar in the cake itself. But I did use some whole wheat white flour to at least put my mind at ease. I know, I'm a bit nutty about health but at the same time I didn't want to compromise the fluffy texture you get from all purpose flour. I also liked this recipe because it uses buttermilk and oil instead of butter. As I've mentioned before I much prefer the texture of a cake that uses oil since it seems to come out lighter and fluffier to me. Maybe it's years of box mix conditioning from my childhood, but it's just what we prefer! This recipe comes together quick which is also a plus while the kids are at school, leaving me with time to run errands or clean the house, or maybe just relax for a second. All the dry ingredients get mixed together, then the wet is added in and combined. Done. Pour that batter into your prepared tin and bake it off! 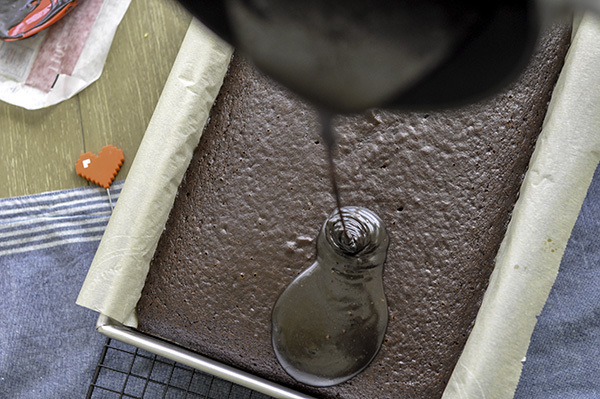 The frosting is cooked in a pot and poured over How easy can it get? I'm hoping to make this into a first day of school tradition. Pre heat oven to 350F. Spray non stick cooking spray in a 13X9 rectangle pan. Line with Parchment, set aside. Add in Eggs, oil and buttermilk. Whisk till combined. Add in the Hot water and continue mixing until well combined. Pour batter into prepared pan. Lightly drop the pan on a hard surface to release any air bubbles and bake for 20-25 minutes or until an inserted toothpick comes out clean. Make the frosting by Melting butter, Cocoa powder, milk, vanilla and powdered sugar in a pot. Whisk to combine and pour the mixture over the warm cake. Top with nuts and sprinkles. Allow to cool before slicing into squares!